For more details of the topics covered in this guide, see Contents of the Guide. Minimize upfront design. Only design what is necessary. In some cases, you may require upfront comprehensive design and testing if the cost of development or a failure in the design is very high. In other cases, especially for agile development, you can avoid big design upfront (BDUF). If your application requirements are unclear, or if there is a possibility of the design evolving over time, avoid making a large design effort prematurely. This principle is sometimes known as YAGNI ("You ain’t gonna need it"). For a more detailed description of the design process, see Chapter 4 "A Technique for Architecture and Design." For more information about application archetypes, see Chapter 20 "Choosing an Application Type." For more information about deployment issues, see Chapter 19 "Physical Tiers and Deployment." 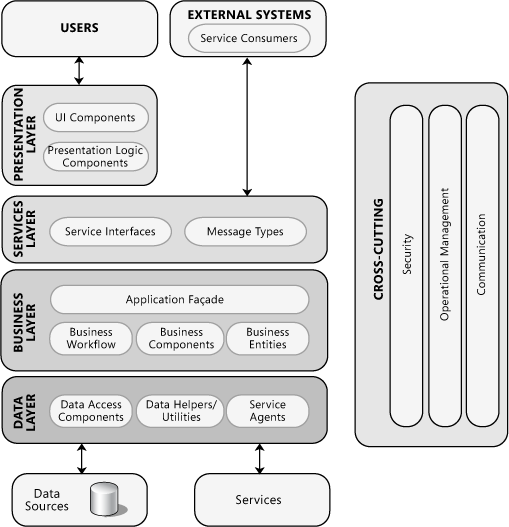 For more information about technologies available on the Microsoft platform, see Appendix A "The Microsoft Application Platform." For more information about quality attributes, see Chapter 16 "Quality Attributes." For more information about crosscutting concerns, see Chapter 17 "Crosscutting Concerns."